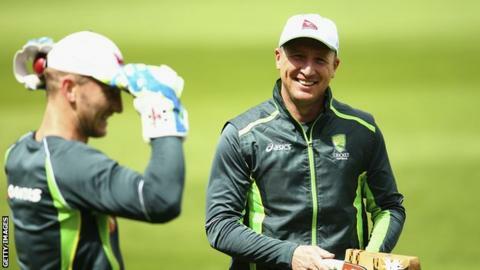 Australia coach Darren Lehmann says not recalling wicketkeeper Brad Haddin for the third Ashes Test was the "hardest decision" he has made in his career. The 37-year-old missed the Lord's win for personal reasons and the tourists stuck with replacement Peter Nevill for the eight-wicket defeat at Edgbaston. Haddin's omission was criticised, with some suggesting it went against the side's unwritten "family first" policy. "Those decisions do not come lightly to any of us," said Lehmann. Clarke says Australia are "playing with 10 men"
"It comes down to performance. The cold hard fact is that Brad has played the last 12 Test matches and made 250 runs and being bowled 15 or 16 times out of 21. "Brad has been a fantastic cricketer for Australia for a long period of time and that would be the hardest decision I have had to make as a coach or a player. "We certainly care a lot about Brad and his family but we had to make a decision on what was the best XI for this particular game." Nevill has scored 106 runs and taken 10 catches behind the stumps since coming into the side at Lord's and Lehmann also praised Haddin for his response to being left out. "Pete did a very good job at Lord's and it was very difficult to change that side. He also did a really good job in this game," said Lehman. "I can't speak highly enough of how he (Haddin) has been with Pete. He has taken over the wicketkeeping coaching role as well as doing his own stuff. "He is a brilliant bloke and one of the best people I have coached." Lehmann was also questioned about the position of captain Michael Clarke, who has struggled this series, scoring 94 runs at an average of 18.8. The head coach was adamant any decision to drop Clarke a place down the batting order to number five would be made by the captain himself. "Michael Clarke gets as long as he needs, he is captain. "I can't complain about the work ethic of any of the players, especially Michael. As far as we are concerned it is about all the players playing well in the next Test match. We will not panic. "The captain has always done the batting order and worked out what is best for the team. For the last two years, four has been his spot because we had younger guys in or people batting in different positions. "If he wants to bat five because of the team make-up, so be it. It is his decision and we will support that."